This is the third in this series of 26 posts, one for each letter of the alphabet, that I am writing during the Blogging from A to Z Challenge, April 2016. You can find all the posts, as they are published throughout the month, by following the A-to-Z April 2016 tag. Aikido students generally belong to a dojo, or school. When we start training we join the dojo, and pay membership dues. 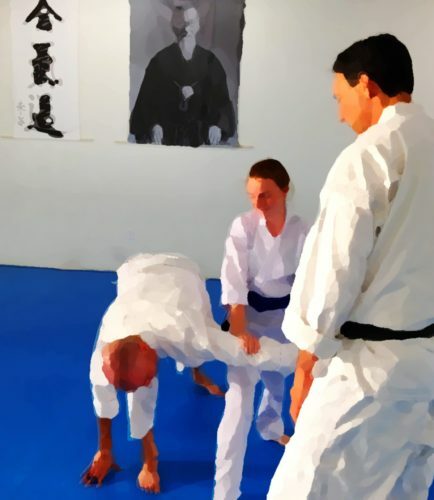 An Aikido dojo is not a typical business. We are not consumers, we are members of a community. We belong. It is ours. We don’t just pay our dues, take our classes, and go home. Belonging to a dojo means becoming part of a committed group of people walking the same path. The dues cover basic expenses, like rent, cleaning supplies, and sometimes a modest (very modest, usually) income for the chief instructor. As students we also contribute to the success of the dojo with our time and effort – cleaning, assisting in kids’ classes, posting flyers, and so on. Occasionally we make material contributions, too, like a new entry mat, potted plants for the garden, or creating weapons racks. The dues keep the dojo open, but the members of the community keep it running. If you are thinking of joining a dojo, you will probably consider the commute from your work or home, the class schedule, the condition of the facilities, and the qualifications of the sensei (the teacher, and usually the owner) and the other instructors. When you visit, notice the people training, too. You will become friends. You will train together several times a week, possibly for decades. You will watch their young families grow, see each other through rough patches, and possibly grow old together. The dojo will be a second family, or for some, a first one. These people will have a powerful influence on who you will become. On the mat you will trust your partners to not damage your body when you are vulnerable in pins or join locks. You will work together to safely practice striking and parrying with wooden weapons. Off the mat you will share meals, travel together to seminars, cry on each other’s shoulders, and celebrate milestones that have taken you years to achieve. We grow together. When preparing for tests, several members in our dojo have mentioned the saying “it takes a village to raise a child,” saying that they feel like they’ve been helped by everyone in the dojo as they refine their execution of techniques, discover new aspects of themselves, and step up to the next level in their training. Experienced students help newer students in class, and mentor them for exams. Senior students often lead classes, learning to teach and improving their technical knowledge along the way. Less experienced students come to open mat sessions to help others prepare for exams by giving their partners attacks (strikes, punches, or grabs) from which to practice techniques, or sometimes just to provide support. We offer feedback, work through the confusing bits, and encourage each other. There is no level where one is finished learning and developing. We watch our teachers grow as well, through their own practice and through teaching us. We are all in this boat together, and all rowing in the same direction.